The results of the Czech parliamentary elections has been a surprise which was expected. This seems to be a paradox but it’s not. The party of billionaire Andrej Babis was supposed to win but it has got shocking 29,64% of votes. 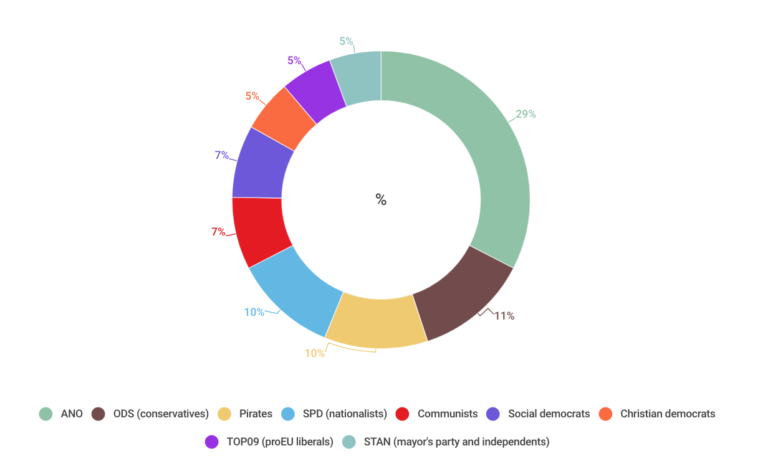 On the second place, there are surprisingly conservatives from ODS, third are newcomers Pirates and fourth is hardline nationalistic, populistic and anti-European SPD. Only then there are communists, then shockingly shrank social democrats and three centre-right liberal parties. There will be nine parties in the parliament, the number never seen in the short history of the Czech Republic. Babis has already announced that he invited all parties to the negotiations and position of his party looks formidable, but there are weeks, even months of negotiations in front of us. To understand the situation there is a need to examine a couple of points. First, all parties need to clarify if they will be willing to negotiate about government with Babis who is accused of EU funds embezzlement (which seems to be a criminal problem) and being an informant of former communist secret service (which seems to be more a moral problem). None of these seemed to bother almost 30 percent of Czech voters. It seems that people in the Czech Republic have very low trust in the judicial system which reflects wider post-transformation dissatisfaction not only among Czechs but also in other Central European post-communist countries. It makes part of transformation fatigue which we have seen already in Poland and Hungary. Only the robustness and stability of the institutional system of any given country can guarantee at what shape liberal democracy, rule of law and pro-Western orientation will survive. And how justice and police will handle the Babis affair in the new situation will be one of the crucial tests of Czech state institutions. The second point reflects wider European trend. About half of Czech voters who participated in the elections (60% turnout) voted for parties with authoritarian tendencies (ANO, SPD, communists). Almost 11% for SPD party of half-Japanese Czech nationalist Tomio Okamura is a sign that Czech society is willing to give a strong voice to anti-EU, antiliberal, strong hand and isolationist force. All that with traditional Euroscepticism represented by ODS and partially by ANO (and EU refusal by communists) can show that the Czech Republic joins the Polish and Hungarian camp at the margins of the European integration. These two counts could lead us to the conclusions that it is the end of the ethos of Vaclav Havel’s legacy as driving force of Czech politics. It is the end of a historical Western dream of a great part of Czech society and even greater part of Czech elites to join and develop the rich club where there are some rules respected by all members, where there are common goals and where all each of member states contributes to stability and development of others. As we have seen in German as well as Austrian elections in the last weeks (and in previous years in Poland and Hungary), national selfishness and strong hand governance masked as nationalism and populism in Europe is on the growth trajectory. Czechia is not an exception. But the sad fact is that it must fight for its European and Western liberal future with new vigour almost thirty years after it went to that path out of communist grey decades.